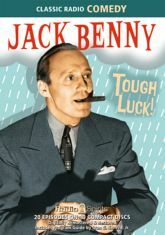 RadioSpirits.com - Jack Benny: Tough Luck! Jack Benny can't get a date�on his birthday. He gets mugged�out in the rain...and then catches cold! His teeth hurt, he loses a sponsor, and he gets shown up by a bunch of eight year old geniuses! Everything seems to happen to him! And he can rely on his usual gang - Mary Livingstone, Phil Harris, Dennis Day, Eddie "Rochester" Anderson, Don Wilson, Bob Crosby, and The Sportsmen - to tease him about it! Join in the fun with this comical collection of twenty trouble-filled radio classics!